Ben Doherty lives on a 25 acre farm in rural eastern Oregon with his wife Missy and their three children: Gavin Elizabeth and Cate. They raise cattle, lambs and chickens. But this was not always the case. Eight years ago Ben went out for a run with his wife Missy, and couldn’t finish the run because of a pain in his leg. After months of fruitless treatment, he was diagnosed with Osteosarcoma, a bone cancer. Over the next two years he underwent several surgeries, a partial femur replacement, and 18 months of trial chemotherapies that successfully destroyed the tumor. Unfortunately, cancer was not yet done with him. Since late 2010 doctors have been monitoring nodules on his lungs. Then in May 2011, he was diagnosed with Acute Myeloid Leukemia (AML), which was caused by the intense treatment he received for the osteosarcoma. Immediately, Ben and his wife moved to Seattle, WA where they had access to a clinical trial that offered some hope. Miraculously, the trial succeeded in getting Ben into remission. Then in September he underwent another clinical trial for his bone marrow transplant. His sister Lisa is the bone marrow donor. 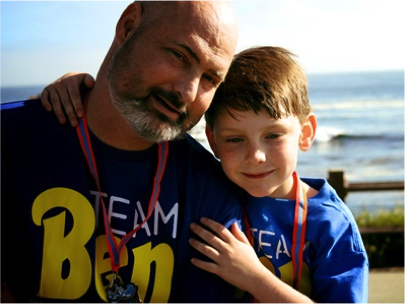 The transplant was successful, and Ben remained positive despite isolation, fevers, infections and brain hemorrhages. Now he is home in eastern Oregon, resting and recuperating. The transplant is successfully growing bone marrow, producing new blood cells, and he is developing a new immune system! Ben’s nical trial was the swimming phase, and I have finished that part of the race. The cycling portion of my triathlon began with the bone marrow transplant. Cycling is the longest portion of the triathlon, both in distance and time, and there is always a time of adjustment before you get into your cadence and become smooth on the bike. Initially, I had some difficulties getting into my rhythm. But I just put my head down and kept pedaling until I got into my groove. Missy adds, “Before Cancer, Ben was an athlete. He loves all sports, is passionate about soccer and loves to run. Running in a marathon like Big Sur was a dream of Ben’s that we hope we can one day fulfill. But until that time comes, I will try to let him live out his dreams through me. So I have been training and intend to run the Big Sur again this year in his honor. Missy continues, “No one knows how much time we have on this earth. When you have a cancer diagnosis, you start to look at mortality issues more closely. Lazarex has given us the most precious of gifts: hope, support, and the ability to stay together as a family. For the first three months of Ben’s leukemia treatment, the children had been staying with their Grandparents while I stayed with Ben at the hospital. This situation worked, but was not great for our family. I felt as if a light went on the day I got the call from Lazarex informing us that we were approved for assistance for our lodging and travel expenses. That day, we were leaving for Seattle and saying good-bye to our children for the next two months. However, with the call came hope. Now we had the financial resources to keep our family together during Ben’s treatment.